Co-opted to Kilkenny Co. Council in 1989 to replace the late Tommy Coogan. The former Comerama worker was elected in his own right in 1991 and elected every time since, increasing his vote each time. Served as chairman in 1996. Member of the Southern and Eastern Regional Assembly, served as Chairman in 2017. Married to Catherine Power, 2 adult children, Daniel and Sarah and 2 grandchildren, Mary Beth and Georgia May. 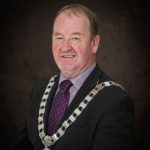 It has been a great privilege to serve the people of North Kilkenny for the past 30 years, and with your help and support, I look forward to representing the Castlecomer Electoral Area for the next 5 years. I’m on your side – I know what its like to lose my job, to face an uncertain future and to battle on.